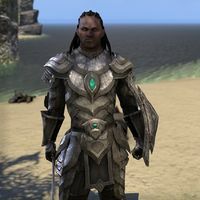 Merric at-Aswala is a Redguard member of the Fighters Guild. He is a friend of Aelif and is central to the Fighters Guild questline. Merric is a follower of Stendarr. The Guildmaster sends you to help Merric and Aelif defeat some Dark Anchors. Find them while they fight off some Daedra, then talk to Merric. "Thank Stendarr! You're with the guild?" Sees-All-Colors sent me. Are you all right? "If the Divines will it. The worms caught us off guard, but we made them pay in blood. Did Colors brief you on our contract? What we seek?" Yes. You thought a Daedric Anchor might drop here. "As you say. There won't be an anchor anytime soon, thanks to the two of us. I should be moving. We had word of another cell north of here, near Skywatch." "Here, if you please. Aelif, stay with our new friends. You two search these bodies, see if you can find anything of note. A pleasure meeting you, oh my comrade." After this, Aelif and Merric has a little conversation about you. Merric: "Watch after the new recruit, Aelif. Colors would hate it if we lost another one." Aelif: "Yes, yes. Aelif will watch the new blood. Hmmph. Resolutes." After you realize Merric is in danger, you and Aelif will find him fighting some Daedra. You will hear his voice, "I think that's the last of them." A vision of a female Dremora will appear and say, "My master has plans for your pure soul, Merric. You should feel honored." The projection and Merric disappears. Save Merric inside Buraniim, and he'll exclaim, "Stendarr! My head!" Talking to him, he'll say, :"She almost had me. Thank you, comrade." "Just need a moment to recover. If you hadn't come along... I'll be fine, Stendarr willing." What was she yelling about wanting your soul? "I heard her communing with the Lord of Lies. Molag Bal is harvesting souls for some dark plot. He's especially interested in the souls of the faithful." "Comrade, grab that book and her notes on the table. I saw her scribbling after speaking to her master. We may be able to learn more about this plot, learn what this "Mortuum Vivicus" is. Grab them. Then let's get out of here." Exit the ruins. Outside, you find the Guildmaster with reinforcements. If you talk to Merric here, he'll say, "I'm so glad to be out of there. Thank Stendarr you saved me from that vile creature." After completing Anchors from the Harbour. "Yes, yes. You sound like my mother, beloved though she is. I shall recover. Rejoice, for some day soon you and I shall take up arms together." After exploring Abagarlas with Sees-All-Colors, Merric can be found at the Earth Forge, waiting for news of your research. "How was your research trip with the Guildmaster, comrade?" Eventful, Merric. I have much to tell you. "Truly? What happened? Where the ruins infested with undead? Stendarr's wrath would have served you in good stead." Colors and I saw into the past. We saw one of the Ayleids try to destroy the Mortuum Vivicus. "Comrade...did you say try? The Vivicus is not some long-destroyed legend?" Molag Bal withdrew the Vivicus to Coldharbour before it could be destroyed. "Then...when Doshia took me prisoner, she was to harvest my soul for this abomination? By all the Eight! We should be moving. Aelif will await us here, keep watch for any unfriendly faces. Come, follow me. And try to keep up." While traveling to the forge itself, Merric will occasionally talk. Merric at-Aswala: "I helped to find this place, years ago...Stendarr's will. Comrade, this news is disquieting." Merric at-Aswala: "I am glad you are here with us. I've made preparations to work the Prismatic crystal, to reforge the weapon from the time of the Ancients." "In truth, I thought this weapon would just be a powerful symbol. It seems we have great need of this important relic." Merric at-Aswala: "Welcome to the Earth Forge! Quite a sight, is it not?" Merric can then be spoken to for instructions on how to assist him in forging the Prismatic Core. "Comrade, we must restore this weapon of old. Make ready for any new plots by the Prince of Lies. I feel the strength of Stendarr flowing through my arms. Are you prepared?" I'm ready. What do we do? "I shall work the anvil. Form the core. You will keep the fire at the proper temperature. Many and many times must the fire be stoked, to keep an even flame and flow." How do I maintain the fire? "Use the bellows, here, to stoke the flame just a bit. Use the valve to my other side to stoke it yet more. And for a truly fearsome blaze, pour fire salts on the coals." What if I get the fire too hot? "The lever, just next to the valve, releases pressure from the forge. But do not worry, I'm certain you'll do fine. Are you ready to begin?" "This equipment is very old and delicate. Stendarr willing, we must try to get it right the first time. Here are the fire salts. Let's begin." Can you repeat those instructions? So the weapon will be done today? "I wish it were so. But no. You and I are merely forming the core. Whatever weapon we decide to make, the runes and hilt and all of that must wait for another day." "Give us some more, but not too much. We are not quite there yet." "Ease up, now. The fire is very close." Merric at-Aswala: "Hah, feel that heat! Just a moment and I'll prepare the core." After the initial forging is completed. Merric at-Aswala: "Now I'll need a larger fire, comrade! Double the heat of the last one." Merric at-Aswala: "More! Make this fire remind me of Sentinel's sands!" Merric at-Aswala: "It is too hot, comrade! Cool it down with the lever. Release the pressure!" "Comrade, you're doing fine. If you keep working that lever, we can still control this blaze." "Stendarr's wrath, that fire is hot. Just a moment, comrade. I'll prepare the core." Merric at-Aswala: "Now we need an even hotter fire, the largest yet. Twice the size of the last one!" "That's done it. Just a moment and I'll work on the core." Once the core has been forged, Merric can be spoken to. Merric at-Aswala: "We've done it. Very well done, comrade!" "Excellent work, oh my comrade! Together, there is nothing we cannot do." Is it done? Have we forged the core? Stendarr's grace, what's that noise?" At this point the Earth Forge will be attacked by daedra lead by Queen Palolel, who has been transformed into a lich. Once they have been dealt with Merric can be spoken to. "Stendarr shield us! The Earth Forge overrun with undead." Merric, he knows we have the crystal. "That was Molag Bal himself. Did you hear his voice? Made my blood run cold. That such an evil thing could be right here, in our midst...."
Merric, how do you think they found us? "I do not know! Perhaps he somehow can track the core itself? If the Prince of Lies is planning to use the Vivicus once again, the Prismatic Weapon is a threat to his plots." "No, not just yet. We came so close! Don't worry, though. I can complete the final steps on my own. This weapon will yet see the light of day, mark my words. The Mortuum Vivicus will yet be destroyed." Does this mean the forge is in danger? "You have the right of it. I'll speak with the Provost Generals, and post some guards. If undead can come boiling up out of the mountain at any time, there's no telling what might happen here." "Yes, we should be going. We must find Sees-All-Colors and inform her what has happened here. Lead on, comrade." Once arriving at the entrance, he will find Aelif and start a conversation with her. Merric at-Aswala: "By Stendarr! Are you all right Aelif?" Aelif: "What happened in there? How did these worms find the Forge?" Merric at-Aswala: "We were finishing up when they appeared. They were after the crystal and tome. How did they know? How did they know about this place?" Aelif: "Aelif does not know. Merric, this whole thing is madness. She has us hunting Daedra, and now they come calling on our doorstep ...."
Merric at-Aswala: "Aelif! Behind you!" Jofnir Iceblade: "Aelif, Merric. I do not rest easily." Aelif: "Dark moons! Guildmaster Iceblade, what's happening?" Jofnir Iceblade: "I was murdered, comrades. Seek my killer. Let me find peace." Merric at-Aswala: "Jofnir, wait! Who killed you?" Aelif: "Interesting. Very interesting. Aelif has her suspicions." "This is...unbelievable. Stendarr's horn, we all thought the Guildmaster died in his sleep." Let's report in to Sees-All-Colors. "I'm sorry, comrade. I knew Jofnir a long time. You're right, we need to report in. So much has happened." "I think...I'll let Aelif lead the way this time. Come." "The Earth Forge breached. Jofnir murdered! Stendarr give us strength." "May Stendarr keep you safe, comrade. We'll have need of your strength in the days to come." Merric can be found at one of the Guild Halls, along with the council. They are there to discuss the disappearance of Sees-All-Colors and her possible connection to recent events. "My comrade, I am very glad to see you again." What's going on? Who are these people? "This is the council of province generals. They run the guild under the direction of the Guildmaster. And they're very concerned. I've been speaking to them about our experiences with the ghost of Jofnir and the attack on the Earth Forge." "We feel...the council feels that we need to further investigate Jofnir's death. You will be their eyes and ears, with Aelif assisting you. She's gone to get some air outside. She can explain in more detail." I'll go find her, then. "If anyone can get to the bottom of this, it's you and Aelif. She's gone up to the roof of the Hall to get some air. Stendarr guard your steps, my friend." Can you tell me more of the province generals? "I'm sure you've seen some of the council as you've traveled across Tamriel. Each represents a former province of the Empire, managing business there the Guildmaster. "Just amazing to think of this as the full council. Skyrim, High Rock, Elsweyr, Valenwood, and Cyrodiil...hardly the whole of the Empire. We've lost a number of generals over the last few years, and a few even quit after Jofnir died." What happened after the last time we spoke? "I finished what I could on the weapon and we repaired the damage from the Daedric attack on the Earth Forge. The core remains unfinished, though, while we deal with these plots." "Aelif reached out to members of the Mages Guild. They tried to summon his spirit, talk to him. They failed. Aelif says something is preventing him from talking to us. I don't know much of such things, but I'm sure she has the right of it." "I wish I knew. I extend her Stendarr's grace, but the council isn't willing to do the same. She disappeared from quarters after the attack on the Forge. They've actually ordered the rank-and-file to search for her." Do you think she's behind this? "No, I don't. But I'm one of the few. Aelif has already made up her mind as well. Not only does she think Colors ordered the attack, Aelif's convinced she murdered Jofnir! Damn it." After returning from Ragnthar with evidence of Sees-All-Colors involvement in Jofnir's death. Merric can be reported to. "What news do you have?" It's bad, Merric. Sees-All-Colors killed Jofnir Iceblade. "I didn't even want to let myself think it. 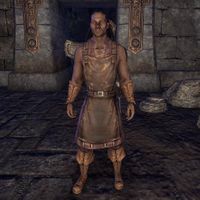 When she disappeared after your visit to the Ayleid ruin...What is your proof, my friend? The council will need solid evidence." Aelif summoned Jofnir in Ragnthar. "Aelif did what? Stendarr's breath, that's disgusting. I'll have to talk to her when she returns. But...I suppose it did answer our concerns. Oblivion take lizards and cats, both!" "Sees-All-Colors will be found, and thrown in a cell. Stay in touch comrade. We will need you when the time comes. Until then...."
"We'll contact you again soon, my friend. As soon as we have word of Sees-All-Colors. You can count on it." Merric reappears as a card in Legends. This page was last modified on 30 September 2018, at 05:28.